All Wasatch Ballet students are invited to participate in our yearly Spring Concerts. Each is an original story ballet (with contemporary, jazz, and tap) written by our director, Allison T. Wolsey, and faculty. Performances are held at the beautiful UVU Ragan Theater. Our annual productions give students the opportunity to learn all aspects of ballet, including acting and mime. 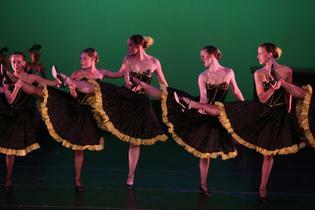 Costumes and choreography are both professional and appropriate. 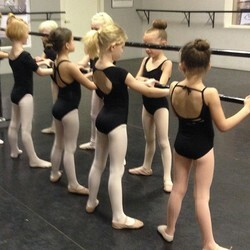 Every class performs at least two dances and helps to develop the story line through acting and mime. Students of all ages look forward to this wonderful WBC tradition! 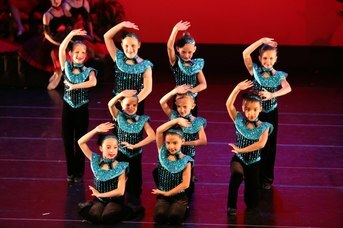 Dancers in our Youth 1 classes and above are invited to audition for one of WBC's Performing Companies. Performing companies rehearse throughout the year and perform at various local venues, culminating in a performance at the Covey Center for the Arts. Company dancers have the opportunity to perfect their technique and polish their performing skills both in rehearsal and on stage. Combine that with the friendships and memories they will create, Performing Companies are a valuable and fun aspect of dance training at Wasatch Ballet. Wasatch Ballet has had the opportunity to produce community events such as Life in a Labyrinth. Though not a yearly event, these community performances are open to performers of all ages. Rehearsals and performances are not only professional, but also a lot of fun for everyone involved! Dancers, singers, musicians, and actors are local artists chosen through open auditions and in collaboration with various community programs.